This is part of a new CAP series called the “Tax Expenditure of the Week.” The series aims to explain the often-confusing constellation of tax breaks in a way the average citizen can understand. Every Wednesday we will focus on one tax expenditure, explaining what it is, what purpose it is intended to serve, and whether it is effective toward that purpose. We will also review relevant reform proposals. Subjecting these dozens of tax breaks to greater scrutiny is part of our broader focus on making government work better and achieving better results for the American people, which is the goal of CAP’s “Doing What Works” project. This week we’re looking at the preferential treatment of capital gains, a type of investment income that gets taxed at lower rates than ordinary income. Why is it a tax expenditure? Most forms of income—salaries and wages, rents, royalties, interest—are considered “ordinary income” by the Internal Revenue Service and are taxed according to marginal rates ranging from 10 percent to 35 percent. But long-term capital gains, or income from the sale of “capital assets” held for more than a year, are taxed at lower rates. The definition of capital assets includes all property held by taxpayers that isn’t specifically excluded—but the major forms of capital assets that produce gains are interests in businesses, securities, and real estate. The current long-term capital-gain rate is 15 percent for most taxpayers who have capital gains (people in the 10 percent and 15 percent income tax brackets pay a zero percent rate, but do not have much capital-gain income). Under a law passed during the George W. Bush administration and recently extended, the top capital-gain rate is slated to rise to 20 percent in 2013 and lower-bracket taxpayers will pay 10 percent. Capital gains have long been taxed at lower rates than ordinary income but today’s rates are at historic lows. Taxpayers, most of them very wealthy, pay $38 billion less in taxes because of the capital-gains tax expenditure—making capital gains the nation’s seventh-largest tax expenditure. The benefits of preferential rates for capital gains are enjoyed by the wealthiest Americans because they’re the ones who tend to receive this type of income. More than 70 percent of the benefit goes to taxpayers with annual income of more than $1 million, a group that comprises only about 0.3 percent of all taxpayers. Our income tax system is designed to be “progressive.” That is, we generally agree that people with higher incomes should pay a greater percentage of their income in federal income taxes, because they can afford to pay more. But because capital gains are concentrated at the highest levels of income and taxed at favorable rates, many of the most affluent taxpayers pay a lower effective tax rate than those beneath them on the income scale. 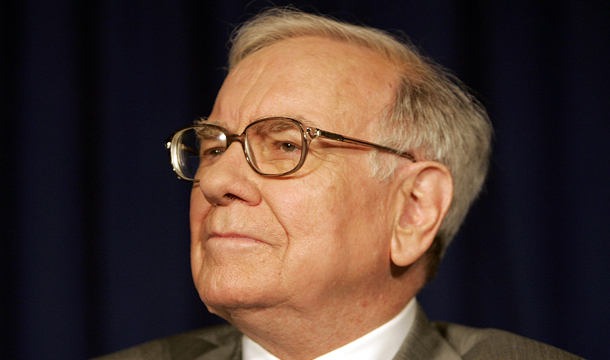 The low rates on capital gains (and dividends) are the reason why billionaire investor Warren Buffett reportedly pays the lowest-overall tax rate of all the people who work in his office, including his receptionist. Tax data show that Buffett’s informal office poll is, in fact, representative of average tax burdens. 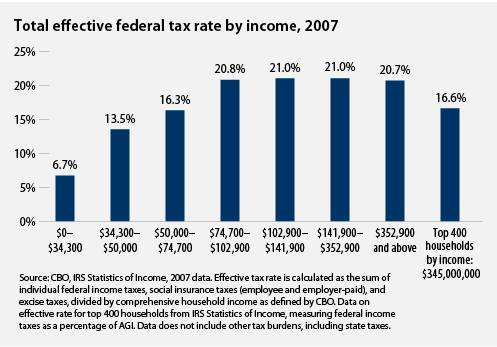 The richest 400 U.S. taxpayers in 2007 paid an effective tax rate of just 16.6 percent. That’s largely because more than two-thirds of this group’s income—which averaged $345 million—was in the form of capital gains and dividends, while most Americans are paid in salaries and wages. This select group probably includes some managers of hedge funds and private equity funds, who enjoy another special loophole allowing them to treat most of their investment-management compensation as capital gain instead of ordinary income—vastly lowering their taxes. Historically, when different forms of income have been taxed at different rates, lawyers and accountants have found ways to create tax shelters that make one type of income look like another type to take advantage of the lower rate—this is just one example. President Barack Obama’s latest budget proposal asked Congress to close the so-called “carried interest” loophole. As we discussed in last week’s “Tax Expenditure of the Week,” a lot of capital-gain income goes entirely untaxed because of the special “stepped-up basis” rule that applies to property bequeathed to heirs. In sum, today’s historically low capital-gain rates have created vast disparities in tax burdens between earned income and investment income. Why are capital gains taxed at lower rates than other income? Proponents of preferential capital-gain rates offer a host of rationales. A common justification for low dividend and capital-gain rates is that corporate investments are taxed twice—once when the corporation earns income and then again when those earnings are passed to shareholders through dividends or share sales. But the corporate tax code is so shot through with loopholes that many corporations pay extremely low rates. And the low rate for capital gains applies whether or not the taxpayer’s gain is on a type of investment that is subject to corporate taxes. Another rationale for the preferential treatment is to prevent the so-called “lock-in” incentive for investors to hold off selling their assets in order to avoid taxes. Low rates can help mitigate this phenomenon. On the other hand, the special rule that allows capital gains to go entirely untaxed when property is passed onto heirs creates an even bigger lock-in effect, yet is strongly supported by those who purport to be concerned about lock-in when it comes to rates. The most common argument for taxing capital gains at a lower rate is that it promotes economic growth by encouraging savings and investment. But the evidence to support this claim is lacking and it is difficult to find any correlation between low capital-gain rates and economic performance over time. The capital-gain rate was 28 percent throughout much of the 1990s—a time of strong business investment, rising productivity, and spectacular economic growth. By contrast, the capital gains and dividend tax cuts of 2003 were followed by a period of weak investment and growth—even before the recession began in 2007. Preferential capital-gain rates represent a national commitment of $40 billion per year. Like all tax expenditures, the rate preference for capital gains deserves further scrutiny—at least as much scrutiny as a government spending program of similar magnitude. While the benefits of a 15 percent capital-gain rate are unclear, two things are certain: The historically low rate has made the federal income tax system less progressive while increasing the budget deficit. Seth Hanlon is Director of Fiscal Reform for CAP’s Doing What Works project. We hope you’ll find this series useful, and we encourage your feedback. Please write to Seth directly with any questions, comments, or suggestions. This series continues next week with a closer look at the tax expenditure for tax-exempt bonds.
. “Table T08-0051,” available at http://www.taxpolicycenter.org/numbers/Content/PDF/T08-0051.pdf.
. Internal Revenue Service, The 400 Individual Income Tax Returns Reporting the Highest Adjusted Gross Incomes Each Year, 1992-2007 (Department of the Treasury, 2007), available at http://www.irs.gov/pub/irs-soi/07intop400.pdf.
. Capital gains are also not subject to payroll taxes, which tax most wages at about 15 percent. 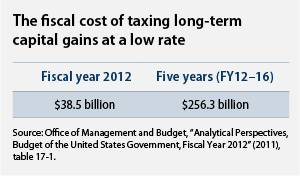 A 3.8 percent Medicare tax on high-income taxpayers’ investment income, including capital gains, goes into effect in 2013.
. For a more in-depth analysis, see: Leonard E. Burman, The Labyrinth of Capital Gains Tax Policy (Washington: Brookings Institution, 1999).